Southern California Edison said Tuesday that Cal Fire investigators are looking into the utility's equipment as a possible origin of recent brush fires in the Southland. The Thomas Fire expanded by 2,500 acres overnight as the unrelenting blaze entered its ninth day Tuesday. The company said Cal Fire investigations now include the role SoCal Edison facilities played in several fires that have consumed hundreds of thousands of acres across multiple counties. The 234,200-acre Thomas Fire continues to rage in Ventura and Santa Barbara counties. 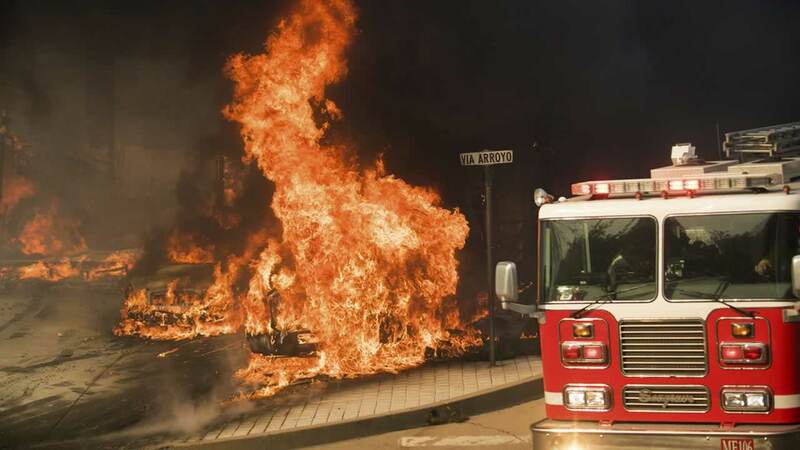 "The causes of the wildfires are being investigated by CAL FIRE, other fire agencies and the California Public Utilities Commission," SoCal Edison said in the press release. "The investigations now include locations beyond those identified last week as the apparent origin of these fires. SCE believes the investigations now include the possible role of its facilities. SCE continues to cooperate with the investigations. The wildfire investigations may take a considerable amount of time to complete. SCE will provide updated information as circumstances warrant." Cal Fire has not yet released the official causes of the Thomas Fire or other Southern California blazes. The Los Angeles Fire Department determined Wednesday that the Skirball Fire that ripped through the Bel Air area was caused by an illegal cooking fire at an encampment near the 405 Freeway. According to the San Francisco Chronicle, the investigation into SoCal Edison would mark the second in the state of a utility this year. Pacific Gas and Electric Co. is also part of an investigation by Cal Fire after blazes in the Bay Area carved a path of destruction through California's wine country and claimed dozens of lives, the Chronicle reported.